Yesterday’s signals were not triggered, as the bullish price action took place below 1.2369. Trades may only be entered before 5pm London time today only. Go short following a bearish price action reversal on the H1 time frame immediately upon the next touch of 1.2436 or 1.2459. 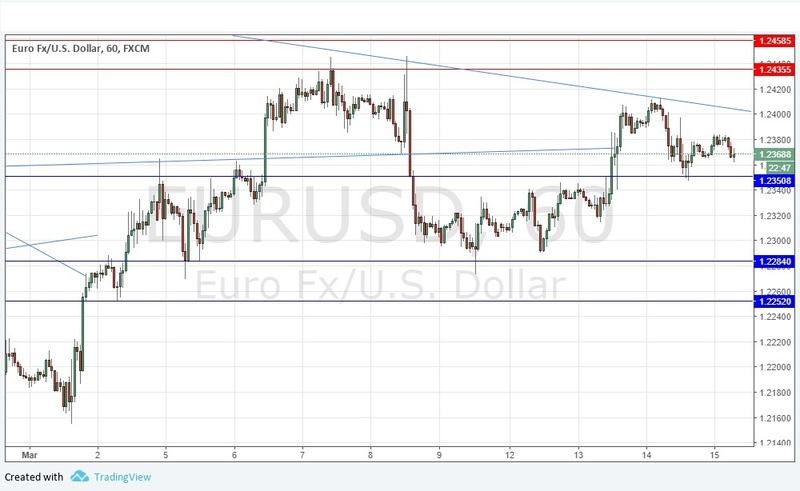 Go long following a bullish price action reversal on the H1 time frame immediately upon the next touch of 1.2350 or 1.2284. I wrote yesterday that current price action during the Asian session was suggesting a pull-back is quite possible over the course of today, but the picture still basically looks bullish, so I maintain my bullish bias. This worked out correctly, although the support ultimately was felt at 1.2350 and not some pips higher as I had expected. The technical picture looks a little more bearish now, and notably more bearish than the highly positively correlated GBP/USD currency pair, which is maybe a bearish sign for the Euro. The problem for bulls is a medium-term bearish trend line connecting the multi-year high and the key swing highs after that was made a few weeks ago. This area also has a few horizontal levels, it is a resistant structure based on the psychological level of 1.2500. So, it may be that the price will struggle if it tries to rise into this area, which begins at 1.2436. On the other hand, there are reasons for bulls to be encouraged, with a clear series of higher lows acting as key support, and a long-term bullish trend. I have a weakly bullish bias on this pair today. There is nothing due today concerning either the EUR or the USD.